An okay movie, the secrets that come out in this film all make for pretty cool twists, but at two and a half hours, this one is long and oftentimes pretty slow. 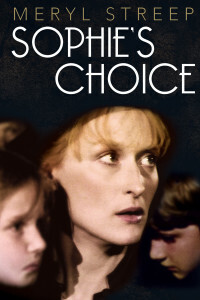 Sophie’s Choice is a somewhat interesting movie. There are definitely things to like about it, inlcuding some pretty intense twists, but ultimately the film is too long and moves way too slowly. This is a period piece that not only represents a time in American history, but also contains multiple lenghty flashbacks to The Holocaust and concentration camps. On top of that, it’s a bit of a mystery about who the members of a couple are and what they are really all about. Basically, movie has e a little too much going on, especially considering the slow pace that it uses to tell them all. The main character is a man named Stingo, (Peter MacNicol,) a young and inexperienced man from the south who is just trying to find his way in the world. He has come to New York to stay for a while and work on his writing before returning home. Stingo is the protagonist who represents the audience in this story about strangers who have secrets and stories and really force Stingo to open his mind up and realize that there is a crazy world out there, where people have been through all kinds of things and lived to tell about it. When Stingo first arrives at the boarding house where he will be spending the summer, a giant, two story, pink building, he hears his neighbors on the floor above him having a good time. Later that evening, he meets them. There is Sophie, (Meryl Streep,) a Russian woman who is older and has a thick accent. Then there is the man she is with, Nathan, an American with a hot temper. When he sees these two for the first time, Nathan is yelling at Sophie and giving her a hard time while she sits on the stairs to the plsce, with her head in her hands, crying. So Nathan doesn’t make a very good first impression on Sophie, but that soon goes away as the couple comes down to Stingo’s room and invites him to have dinner with them. They get to talking, with Nathan apologizing for his behavior earlier, and soon the three of them are the best of friends. 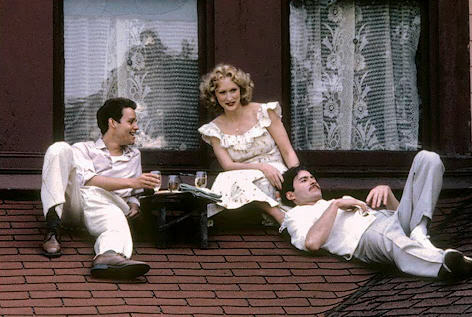 They go to Coney Island, go on rides together, and sit out on the roof of their house together, getting sun. Stingo notices that Sophie has a number on her arm, to show that she was once a prisoner in a concentration camp. He tries to ask her about this, but clearly she is upset by it. In speaking with Nathan, Stingo learns that Nathan has an obsession with learning about the Nazis and wanting to see them all punished. Perhaps this is for Sophie, perhaps not. We see a flashback to how Nathan and Sophie met. There are many flashbacks in this movie, and that’s one of the film’s flaws, having too many of them. The two of them met in a library in America. Sophie was looking for a particular book in the big hall and the librarian, (who sat at one of those huge desks that is more like a pulpitt, looming high above everyone else,) started giving her a hard time, insisting that no such book exists. The argument continued for so long that Sophie ended up passing out, falling to the floor right there in the middle of the library. That’s when Nathan showed up and swooned down to help her out. As Stingo becomes closer with Sophie, she starts to open up more to him about her former life. Sophie lived in Poland, where she had a husband and two small children. Her father was an accademic and well-known and respected. Sophie’s tells the story of how both her father and husband were taken to a concentration camp and killed. Stingo begins to investigate. Every so often, Sophie and Nathan disappear from the house, and Stingo goes looking for answers to find out more about them and where they might have gone. That’s when he learns the truth about Sophie’s father. As it happens, this is just one of the secrets that Sophie has been keeping. Stingo gets even closer with her, and she tells him more. One night, the two of them are both concerned about Nathan. He has disappeared, and they have no idea where he is or what he is up to. When Nathan does show up, he catches the two of them looking way to chummy, and begins to accuse Stingo of all kinds of things regarding him and Sophie cheating on him. Nathan is a loose cannon. As Stingo continues investigating, he learns a number not only about Sophie, but about the real Nathan as well. And then there’s Sophie’s secret. It’s the thing that the title for the movie refers to. It’s a strange thing when a movie features a major twist, or secret, at the end, and yet the title of the film announces it. This is a case where most people who watch this movie probably already know what the choice is, or what it is about. Still, the movie was very sucessful, and is a film that everyone knows, perhaps because of its title and unique way of dealing with a horrible situation. 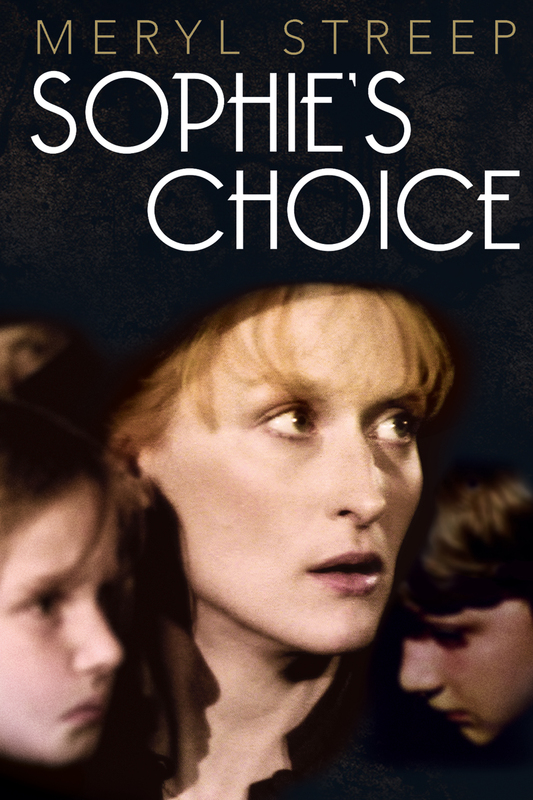 Her choice involves something that happens at the concentration camp with her kids. It takes a lot of flashbacks to her time spent at these camps, before we finally get to it. This movie is definitely interesting, with the Kline character, Nathan, being so wild and ferocious, and with Meryl Streep’s character being so sympathetic. There are lots of secrets, and they all come out in the second half of the film. Maybe one or two of them should have come out in the first half, to make the movie feel a little faster-paced. The flashbacks are too long, and the pacing is too slow. If at least half an hour of this movie had been cut out, it might have been a much tighter and more compelling film.